AUMsilence self delivering oligos achieve highly efficient and potent antisense-based gene knockdown. No need to use toxic transfection regents. Especially designed for primary cells and very difficult to transfect cell types. Ideal for animal studies. Suited for fish and amphibian model systems as well. Highly recommended as a replacement for siRNAs or other oligonucleotide approaches. AUMantagomir self transfecting oligos serve as potent antagomirs by binding with miRNAs and prevent their hybridization with their target mRNAs. AUMmirblocker self transfecting oligos serve as competitive blockers/decoys against miRNAs to inhibit their binding with target mRNA. AUMmirblocker oligos will bind with the targeted regions on the mRNA and inhibit binding of miRNA with the mRNA. AUMlnc oligos achieve potent RNase H-mediated cleavage of the target long non-coding RNA. AUMskip oligos make suitable candidates for exon skipping experiments. AUMblock oligos act as steric blockers and inhibit translation elongation. AUMblock oligos act as decoys and repress protein expression and do not induce mRNA cleavage. AUMprobes serve as excellent probes or decoys to suit a wide variety of experimental applications. Why use FANA Technology? Here is why. Transition of RNA silencing and manipulation approaches from the bench to the bedside has thus far been hampered by a number of challenges which are commonly encountered by the existing research products. Some of the challenges include inferior RNA target accessibility (i.e. accessibility to the target sequence), off target effects, less potency, high toxicity, poor extracellular, poor intracellular stability and most importantly delivery into target cells. AUM’s next generation oligonucleotide technology is based on innovative FANA modifications which gives our oligonucleotides an unprecedented highly efficient design. FANA technology platform provides significant improvements and enhancements over conventional RNA silencing and regulation tools and cuts the overall costs of running an experiment. AUM’s RNA silencing and regulation tools are extremely versatile as they take advantage of a variety of FANA architectural designs developed through extensive research and development efforts. Ideal for primary cells or difficult to transfect cell types. Self-transfection/delivery (Gymnotic Delivery): FANA oligos are taken up by the cells without the use of any delivery agent. No need to use transfection reagents. This reduces toxicity caused by transfection agents.Cellular delivery of the oligonucleotides without a delivery agent (case specific). This also reduces toxicity typically caused by transfection agents. Resistant to degradation by serum and cellular nucleases. Provide enhanced duration of activity. Low non-specific protein binding reduce toxicity. Ability to bind to RNA target with high affinity and specificity. Less off target effects. Extremely potent and effective; high bioavailability. PHILADELPHIA, Dec. 1, 2016 /PRNewswire/ -- AUM LifeTech in collaboration with the United States Department of Agriculture has developed a novel Non-GMO RNA silencing approach for bacteria, insect and pathogen control with a focus on citrus trees and fruits. Huanglongbing, a fatal bacterial citrus disease, also known as citrus greening has already caused an estimated $15 billion loss in revenue to the industry. Citrus is the most consumed fruit in the US with an estimated annual $9 billion industry. These numbers are rapidly changing with losses increasing and industry size decreasing every year. According to a study funded by USDA it was noted that Florida, which produces 66% of the total US citrus, saw an almost 60% reduction in citrus production over the past 15 years. Brazil and China which produces almost twice than the United States are also struggling with citrus greening. Read more. 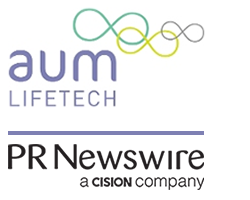 PHILADELPHIA, Oct. 12, 2016 /PRNewswire/ -- AUM LifeTech, Inc. has successfully developed multiple applications for its next generation FANA RNA silencing technology to advance biomedical research and therapeutic development. Conventional RNA silencing technologies like siRNAs and shRNAs have a lot of issues some of which include off target effects, toxicity, less potency, poor stability and most importantly they need transfection agents or expression vector systems for delivery into cells or animal models. AUM's FANA technology is an effective solution to these challenges in a highly cost effective way. New encouraging data on the use of FANA RNA silencing technology was recently presented by several of AUM's academic collaborators from North America and Europe at the annual Oligonucleotide Therapeutics Society (OTS) meeting in Montreal, Canada. Read more. Fresh hope has been offered to HIV patients after US-based scientists recently revealed a promising new method to combatting the disease. 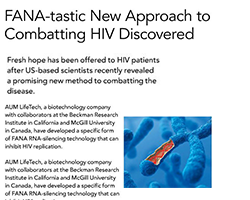 AUM LifeTech, a biotechnology company with collaborators at the Beckman Research Institute in California and McGill University in Canada, have developed a specific form of FANA RNA-silencing technology that can inhibit HIV replication. 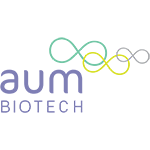 Veenu Aishwarya, founder and Chief Executive Officer of AUM LifeTech said in a statement: “The ability of our FANA antisense technology to be self-delivered without the use of any conjugates or formulations makes it very attractive for the development of nucleic acid therapeutics.” Read more.